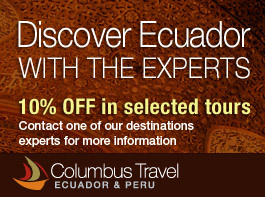 All-inclusive Scenic Tours of Ecuador are the best way to experience the diversity of the Andes. Columbus Travel designed three complete Ecuador Tours with you in mind that will travel along the famous Avenue of the Volcanoes, winding through colossal giants like Antisana, Chimborazo, and Cotopaxi. We'll also visit each highlight along the way like Cuenca, Ingapirca, and the Devil's Nose Train and Guayaquil. Continuing north you'll get to know the charming Ecuadorian cities and villages that make their home in the highlands like Quito, Cayambe and Otavalo. Included in these Andean tours are also stops to the Papallacta volcanic hot springs and the cloud forest of Mindo, where a wide range of birds and other wildlife can be found in the misty mountains of Ecuador. Are you ready for an exclusive Andean adventure? Contact Us today and we'll get you on your way. Guests have also searched these other tours and hotels: Andean Short Trips, Quito City Tours, Guayaquil City Tours, and Andes Hotels.